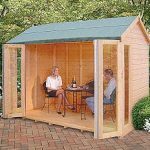 A summerhouse that measures 4 m wide and 4 m deep, this building is part of a range of three, this one being the most compact. The building has thick cladding, at 35 mm, which should provide a strong barrier against the elements. The cladding is supplied at 35mm as standard, but you are able to purchase even thicker cladding, at 44mm. This Clubhouse also has 19mm tongue and groove timber in the roof. This provides plenty of weight, and complements the 35mm cladding in the walls. Overall, this makes it a strong and robust cabin. The Clubhouse does come with single glazing, which is toughened plastic. There is an option to purchase double glazing for the windows, which you can have in the Georgian or Modern style. The flooring options are bearers only, or a 19mm thick flooring that BillyOh offers as an extra. Finishes can be purchased from BillyOh, and come in four basic styles, as well as eight premium finishes and a varnish. At WhatShed? we are big fans of the Clubhouse range, and this is mainly because they are so well made and offer an amazing amount of customisation options. 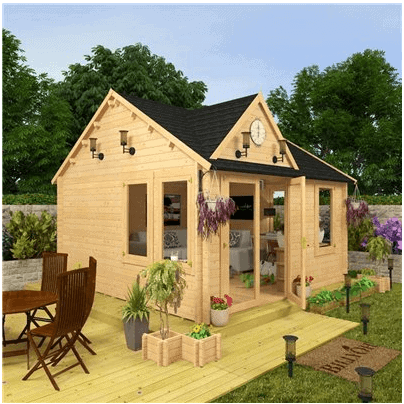 In essence, you can pick up a very high quality building and make it your own with the various choices the manufacturer offers. This building is no exception. Out of the three buildings in the range, this is the smallest when it comes to width. All three have the same depth. It’s no slouch though, and we like the fact that you get a healthy 4 m of width with this one. That is still plenty of room to have a good sized home office, or an entertaining space. If you wanted a little more space the next building up in the range, the Clubhouse II, only has an extra half a metre in width. Putting things in perspective, nearly half the wall space or width is taken up by double doors, and this makes a big difference to us. It basically tells us that BillyOh are trying hard here to help maximise the space it gives you. The frontage also includes a lovely large window. We will cover the details on the windows later in this review, but simply because there’s so much packed into that 4 m of width we think this is an excellent building. Of course, if you need that extra width, there are the two other options in range of the II and the III. With the III you get an extra whole metre of width and another window to boot. Moving into the building, and we were struck with the lovely heavy doors in the Clubhouse I. If you look at our review of the II elsewhere on this site, for example, that same effect is there. They are satisfyingly heavy, with the kind of strength that you expect in a large building. And then you get that perfect square of space inside the building that is big enough to manage a couple of sofas and a desk and chair. We were thinking ‘cosy home office’. If this is what you use it for, you’ll be pleased with the space inside, and the modern look on the outside. The doors are also extra high, so you enter feeling like you have plenty of room to move. That modern look is supplied mainly through the cladding. 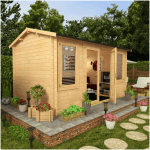 If you take a look at any other BillyOh log cabin reviews on What Shed, you’ll see that the company likes to ensure the bigger and tougher buildings have extra thick walls. 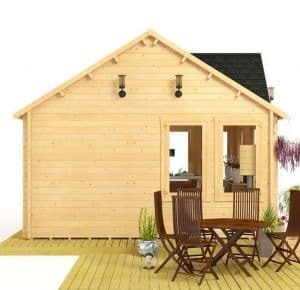 This makes sense on a solidity level, but if the walls on a cabin are done right, you can also have excellent insulation and an all year round building. So how does the cladding fare here? Well, at £2.5 k in cost, you get what you might expect. The walls are 35mm thick, and they’re tongue and groove too. This stuff is not going to move for anything, not even the toughest storm. And that 35mmm will also act as an insulator, immediately taking away the worry of a potentially freezing log cabin in January. In other words, if you want a cosy office, it’s here. And If you’re looking to put a couple of pieces of gym equipment in there, it will be a warm and secure gym in the winter too. If you want to add even more thickness you can with a 44mm option that you buy from BillyOh. Why would you want this? Let’s just say you’ve bought a building that costs a lot of money, and to clad it in the thickest wall you can have makes some sense. Here you get massive insulation, rigidity and soundproofing. It’s an attractive option, and we’d be lying if we said we didn’t think it was worth the extra £109. BillyOh usually impress us a lot anyway, but we liked the 35mm thickness as standard. And the 44 mm is ideal. You will feel like you’re walking around in the next best thing to brick, it’s that tough and rigid. More good news here. Having a strong heavy roof has obvious benefits for the longevity of the building, but a heavy roof also means you have a few more options with your roof covering. 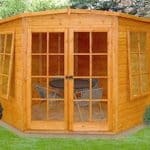 Here, BillyOh has supplied the cabin with a 19mm roof in tongue and groove. It comes without a cover though. So things get a little pricey here. Justifiably pricey, but still a little more expensive than you might expect considering you’ve spent £2.5 k on a building. That heavy roof has an advantage in that you can chose to cover it with roof shingles. These are heavy duty, UV resistant, and also come in a choice of colours. They’re fire retardant too. You can buy mineral felt, and this is easy to fit and does provide a strong level of protection, but we would choose shingles because they just come out as tougher and more attractive. 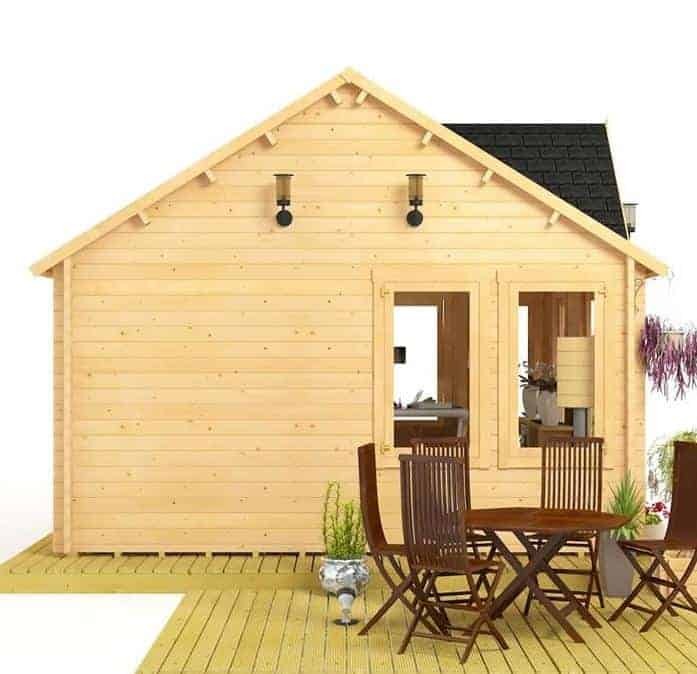 To sum up here, you will have a good and solid roof with mineral felt, but fork out the extra £285 and you can have great looking shingles that offer more strength and resilience, as well as durability. There is one thing the customer really needs to know first of all about the glazing in this building. BillyOh has provided the building with single glazing. You get to choose between modern or traditional style looks-wise, but the standard issue here is single glazing. This is not glass. It’s actually a common misconception that single glazing means glass in outdoor buildings. It simply doesn’t. This is plastic, and for that reason immediately makes this a seasonal building. Plastic glazing will not keep the interior of the cabin warm in the winter. So if you are okay with just using this building in the summer, that’s fine. But we can’t see anyone who spends this amount of money being ‘okay’ with that. Your best option here is to order the double glazing option outright. 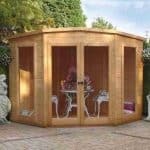 Even if you don’t use it as a gym or home office or even party room throughout the year, you know that if you want to drop in for a bit of an escape, it won’t be freezing cold. A word on the two styles. 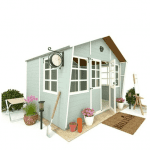 We like the traditional style here at WhatShed?. It looks pleasant, and fits in with our own personal preferences on glazing looks. But we can also see why the modern, with it’s clean look, will appeal. It’s all down to personal taste. As with many of their other buildings, including those in this range, BillyOh has supplied this one with bearers only. Customers will need to supply their own floor unless they purchase the 19mm tongue and groove option offered by the company. We fitted the tongue and groove,and it is a strong, sturdy floor, which matches the rigidity of the thick walls perfectly. It kind of finished it off nicely. To be honest, this will give you a strong floor all year round. This isn’t a small building and a strong floor is a good idea. If you’re going to fit your own, we suspect you’d pick tongue and groove anyway. because a simple plywood floor would not cope. This building is the same as the others in this range when it comes to treatment. Giving your building full protection with the premium paint BillyOh sells makes sense to us. There is a also a standard finish option that has four colors. If you have a plan in mind of your own, you can take the building completely unfinished and apply your own solution. We like the quality a lot, and this is all boosted by the tongue and groove element. 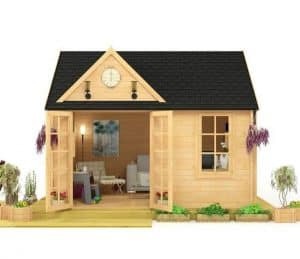 We’d add shingles and double glazing from the options for a top score of 10. There is nothing wrong with this building and it’s longevity. 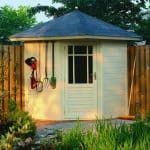 Tongue and groove will stand you in good stead for years, and you can even make it thicker through the cladding options. Plenty of space for entertaining and a small home office, but if you want more opt for the bigger versions. This is easy to put together. It will be manageable by two people and shouldn't take more than a day or two to complete. There is plenty here in regards to value. 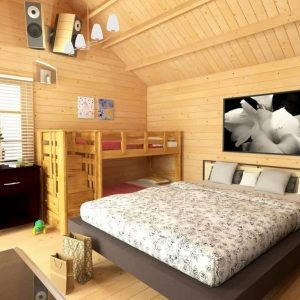 It has excellent durability with that tongue and groove, and decent space. The roof is great too. Single glazing takes the score down, but add a couple of the extras for the ‘10’ score. Final Thoughts: The Clubhouse range is sturdy, and that is helped a lot by BillyOh ensuring that it can fit tongue and groove wherever it can. This makes a big difference in our opinion, and lifts this building above others in the same price range. At the same time, we can’t get over the fact that you have single glazing here as standard. We can’t see why someone wouldn't want this as a year-round building, and plastic doesn't cut it. With some extras, this building starts to make more sense. As a base model, it needs a little work. Tough and durable, sure, but missing some warmth. Yes, the price is high BUT the reason I gave that part a high rating is because LOOK AT IT! It looks like a mini house. It is so roomy and has tons of potential when it comes to what you can do with it. 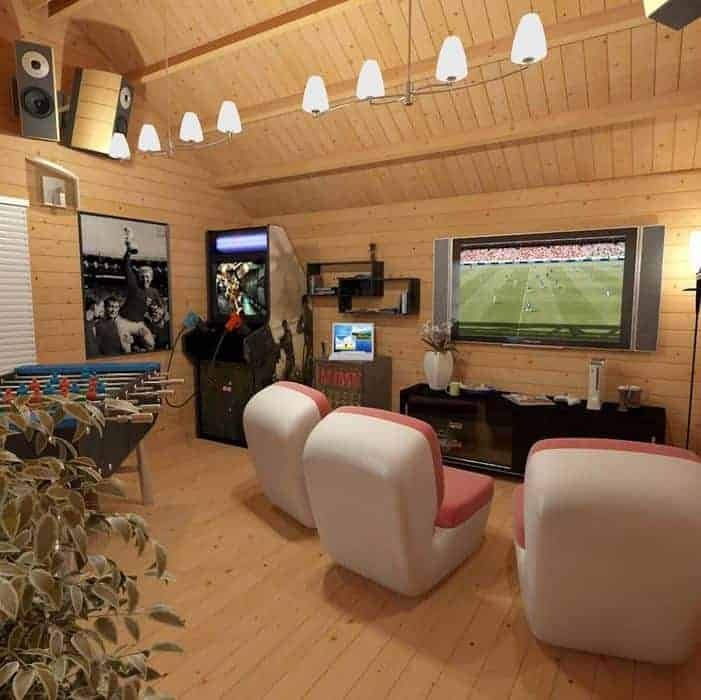 You can make it a get a way from your home, a spot for the kids plus you to work, a home office, a game room, an exercise room, etc. For myself, I have my computer, TV, couch, games, and elliptical out there. I use this every weekend. The exterior clock is brilliant and the outside lights make me feel at ease having to go outside in the middle of the night.